What schools did you consider for after Hesston? Or did you always know you were going to K-State? Before I chose to start at Hesston, I always thought I would go to Goshen (Ind.) College, a four-year private college. But during my time at Hesston, I figured out I wanted to be an occupational therapist, so my plans changed. I knew I would stay in Kansas, so it came down to deciding between the University of Kansas (Lawrence) and K-State. After visiting both schools, there was no question that K-State was the right choice and would be the most beneficial for my future. Hesston gave me the college experience so I wouldn’t be completely lost when I started the next chapter of my life at a new, and much bigger, school. There are too many to count, but I can name a few. I absolutely loved the community atmosphere, being able to walk across campus in two minutes and always being able to see a familiar face. The instructor-student relationship is very unique and special. I loved being comfortable enough to get help from my instructors when I needed it, and how they went out of their way to ask me how my day was and be there to support me through difficult times. Being a resident assistant (RA) was another favorite. I built relationships with the amazing women in my mod and had the support of the other RAs. One of the most important parts of my Hesston Experience was the friendships I made that will last a lifetime. What are your favorite parts of your K-State experience? K-State has a family atmosphere, something that is hard to understand until you experience it. You may not know many people as you’re walking through campus, but students are always open to stop and help you. Football games are a blast. I joined the new sorority on campus, so I have been placed in leadership positions. I’ve helped raise money to support diabetes awareness, and I’ve been part of community service opportunities. My favorite things is joining Christian Challenge, a student ministry that meets every week to worship together. They also provide small groups, and the one I joined has been one of the biggest support systems I’ve had in my faith and everyday life. Yes. I’ve been able to experience so much in a matter of a few years. Instead of going to a college after Hesston where many of my friends went and where I would be in the same environment, I went somewhere where I only knew a handful of people and I had to go out of my way to get involved. It was kind of scary at first, but now it’s exciting to look back and see all that I have done on my own. What do you want to do after finishing your bachelor’s degree? After this, I plan to go to medical school. At the moment, my choices are the University of Kansas School of Medicine, Creighton University (Omaha, Neb.) and Ohio State University (Columbus). 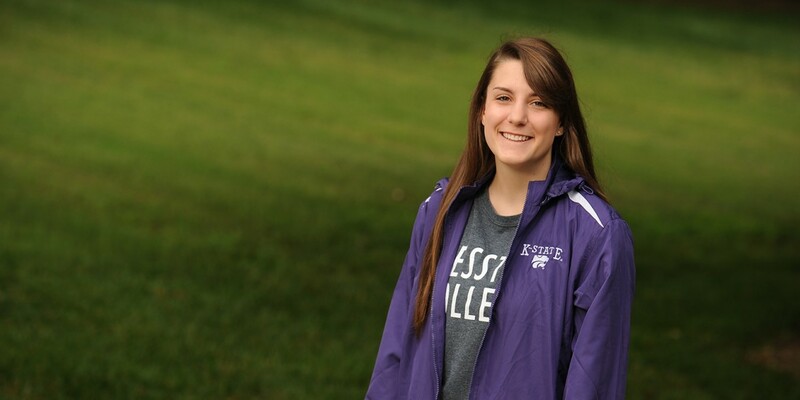 What would you tell high school students considering starting at Hesston and transferring to K-State or any state school? This is the one of the times in your life where you get to decide which pathway you want to take and the options and opportunities are endless. Starting at Hesston lets you choose more than one path!